Three years since we launched the Blue Planet Odyssey, and more personally, thirty seven years since I was last here: the path across the ocean to Tuvalu has been a long one for me. 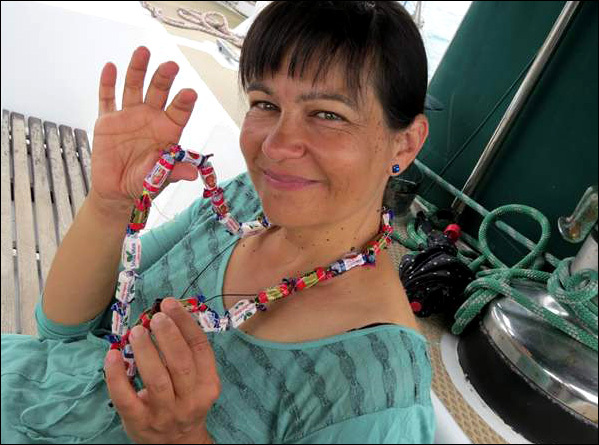 After all the plans, two Odyssey boats have made it: so a big thank you to Drina and No Regrets for the effort. We are only the 6th and 8th yacht to visit this year, (a Danish yacht arrived in between us) so if you want ‘off the beaten track’ this is a destination that certainly qualifies. 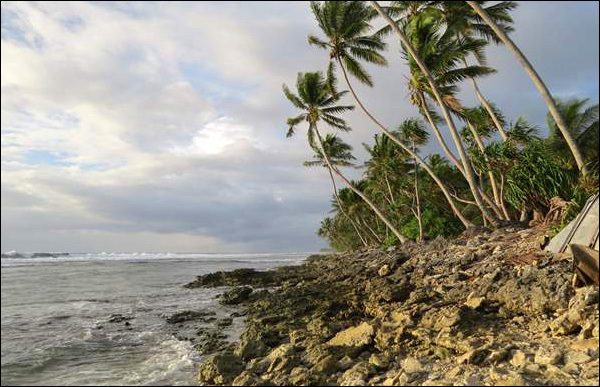 No Regrets and Drina in Funafuti – Photo by Zeke Holland. 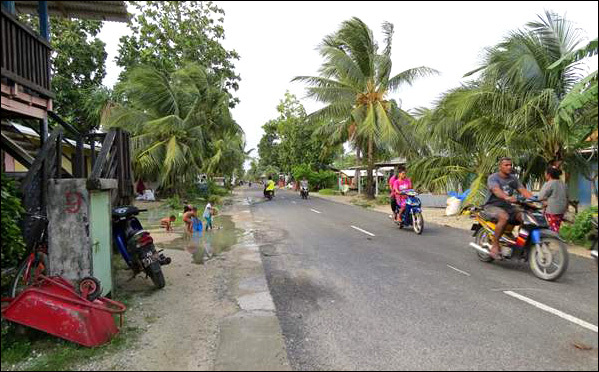 As I watched the green coconut palms rise above the sea on the morning of Tuesday 21st July, I thought nothing could come to beat that landfall moment. I was very wrong: this past week has brought such a treasure of moments it is hard to know where to begin. First, the personal: a family reunion. 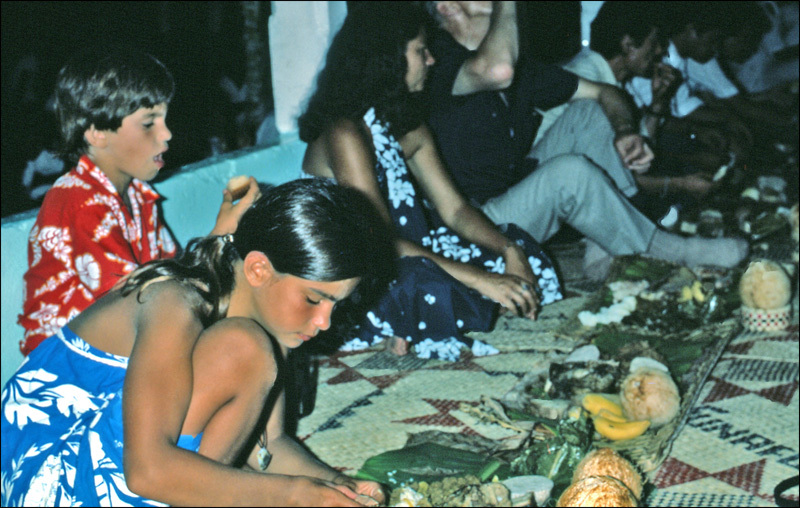 During our two visits to Tuvalu in 1978 and 1979, we made friends with Tinilau Lome from the island of Nukulaelae in the southernmost part of the island chain, and as I and my mother recounted in our books Child of the Sea and Pacific Odyssey, spent a brief but memorable visit there, welcomed by Tinilau’s family. My brother Ivan made friends with Tinilau’s youngest son Fuolo, and the boys swapped names in the traditional way. Although in adulthood neither quite kept it up, I knew from Facebook (the joys of the internet!) that Fuolo had named his son Ivan. 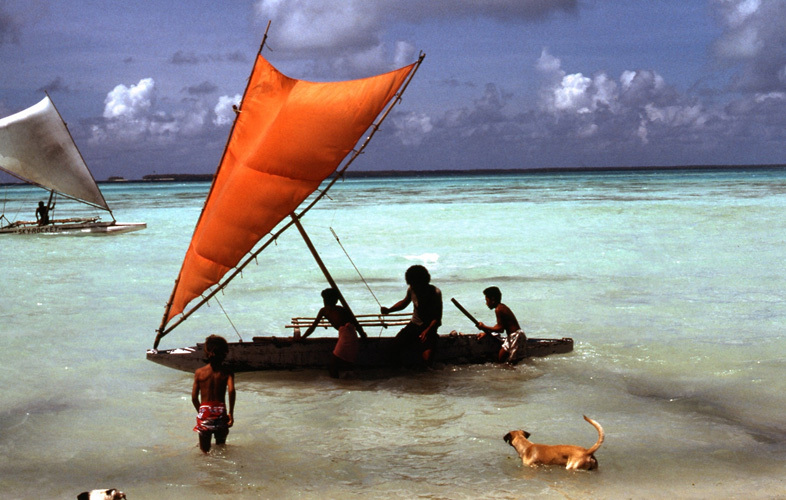 Nukulaelae, 1979: Ivan (in the foreground) learns to sail an outrigger. One of the boys in the canoe is Fuolo. Nukulaelae has no protected anchorage, so although I’d discussed perhaps visiting again this time with Michael, Drina’s captain, in the end we decided against it. So imagine my delight when we found out while clearing customs that Fuolo was in fact living on Funafuti. It didn’t take long to track them down. Fuolo, and his older brother Saosaoa, who remembered our visit well as a young man helping guide us through the reef passage on his canoe Skyrocket, now live at the end of Funafuti with their extended family. Their pleasure at our reunion was as great as mine: it turns out we were no more forgotten to them than that briefest of stays on Nukulaelae was forgotten to me, despite the long years passing. It is hard for me to express in words what it means to share a few hours with the Tinilau family again, to have the privilege of being once again part of their family. On the small piece of land surrounding the family’s house, they raise pigs, grow papaya and some pulaka (or taro, one of the traditional staple root crops), tap coconut palms for sweet toddy, and have a boat for fishing expeditions on the protected lagoon. It is only a few paces, however, from lagoonside to the seaward part of the island, which brings me to my second memorable moment. As we stepped ashore from the dinghy to clear customs at the commercial dock, we saw a line of containers, and beyond, a narrow asphalt road busy with scooters (which turned out to be the favoured mode of transport here). As we made the few steps to the road and the customs office, I was surprised to see beyond the road, and a few palm trees, the sea again – the windward side of the island. 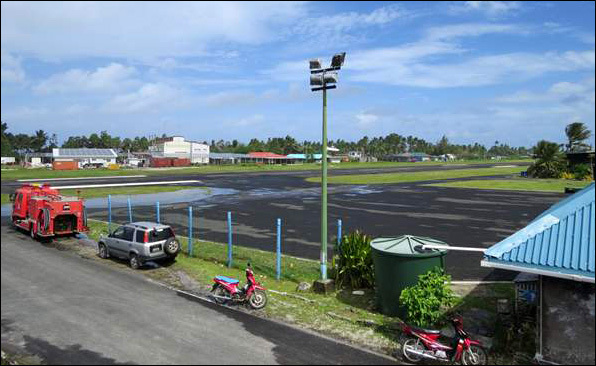 That was literally it, there is nothing to Funafuti at all, which except for a broader bit at the town centre, where the airstrip is located, just consists of one narrow strip of land just about wide enough for one house, one small garden, and the one road. To seaward there is no offlying barrier reef, so the ocean beats with its full force against the coast. From the sea Tuvalu’s islands looked vulnerable; now, when I stand here, I really see how this land is at the mercy of the ocean. This fact of life was brought forcefully home in March 2015 when Cyclone Pam caused huge storm surges to hit most of the islands. 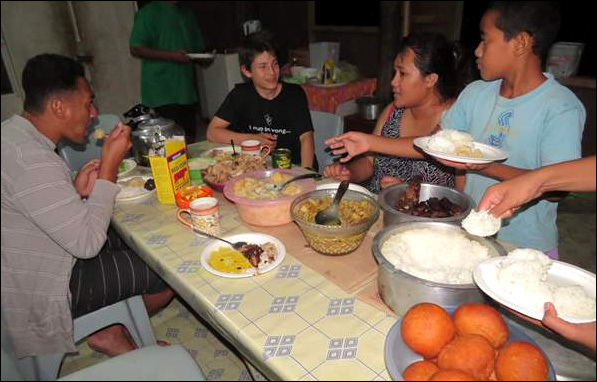 Saosaoa Tinilau had been working on Nukulaelae on a national project to increase food security by encouraging people to establish home food gardens. 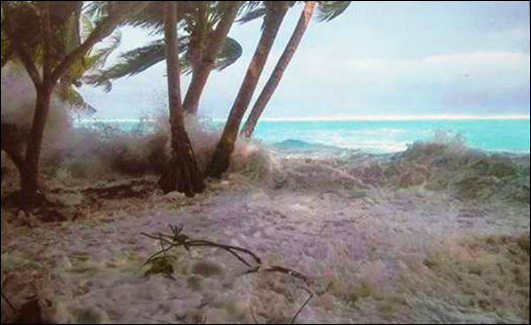 During “TC Pam” (as they call it here) the waves swept over Nukulaelae and destroyed all the kitchens and gardens. As I said in my previous report, climate change is not an abstraction, but a hard fact of daily life here. Which brings me to the third moment: politics. During our welcome meal with the family, Dan and I met Saosaoa’s eldest son Soseala, a US-educated climate scientist who now works for the Government and will be part of the delegation attending the crucial Paris climate change conference in December this year. Soseala was just about to leave for Fiji for talks on the Green Climate Fund, set up to provide help to places such as Tuvalu. However, the criteria for accessing these funds were proving almost impossible, a point Soseala had been asked to make forcefully at the meeting, on behalf of the Prime Minister. In the end we didn’t have to wait that long. 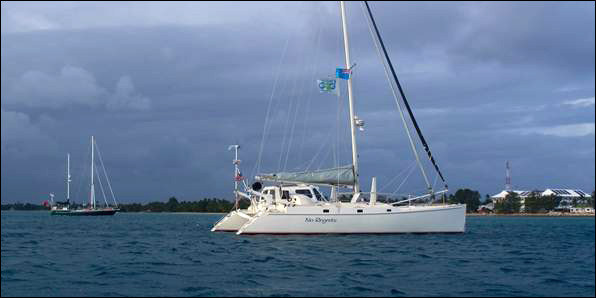 Having passed on information about the Blue Planet Odyssey via an old Tuvaluan friend of Michael Thurston’s, Silanga Kofe, who works for the Government, and requested a possible meeting with the PM, on Friday morning I went ashore with Zeke Holland from No Regrets, and his Canadian crew Bob Shanks. A young man was waiting for us at the dinghy dock. ‘You’re invited by the Prime Minister to a workshop this morning,’ he explained. How could we refuse? 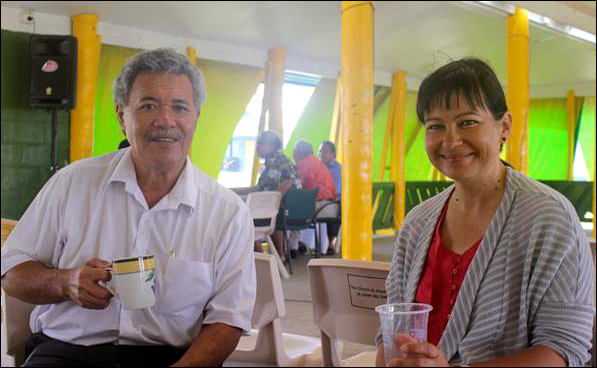 It turned out that it was an official signing of Tuvalu’s accession to the UN Convention against Corruption, and during the tea break Mr Kofe introduced us to the Prime Minister. Before we knew it the three of us were sitting and having a cup of tea with him. The Hon. 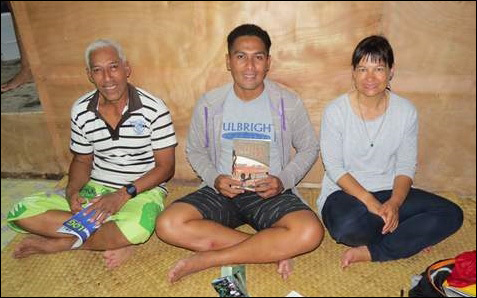 Enele Sopoaga is an inspiring leader, and he has clearly made it his priority to raise awareness of Tuvalu’s plight around the world, being freshly back from a visit to Europe. 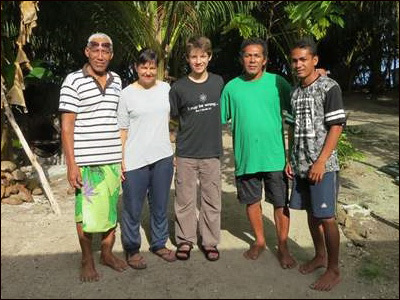 ‘Vulnerability is Tuvalu’s enemy number one,’ he told us, ‘and it is up to people now, not politicians, to raise awareness.’ We were pleased that he appreciated the small efforts of the Blue Planet Odyssey to do our bit, and all three of us came away from the meeting inspired to do more. And the final moment -? so much has happened in this past week I can only give you a snapshot, but I will end with moment number four. This Sunday was Tuvaluan Mother’s Day, so we went ashore to morning worship at the nearest church, part of the Vaiaku parish. Doina’s own mother’s day sweetie necklace! As I entered, a necklace of sweets was placed over my head, as all the mothers received – and they were in charge of the service, middle-aged and elderly women, all dressed in white, with flowers in their hair, their readings and prayers full of emotion. As the first hymn began, and the women sang high, with the men underpinning the harmony with their bass, vigorous voices, my eyes drifted out of the open door to where the sea was, a few metres away, and beyond, No Regrets swinging at anchor. 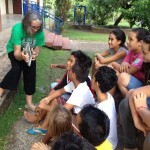 The harmonies of the hymn singers (no one does this as well as the Polynesians!) was so beautiful, and all I could think was: so many beautiful things in this world have been lost forever. Let not Tuvalu be one more. Because ‘Tuvalu’ is not just a name on a map, but a real place full of real people: families who work hard and play hard, who seek to get on in life, who enjoy a song and a laugh, and who love their homes and their islands. A place where each person you meet as you walk through the town will smile and greet you with a cheery ‘Talofa,’ just as they did thirty seven years before. In 1978 no one had heard of Tuvalu. Now most of the world has. 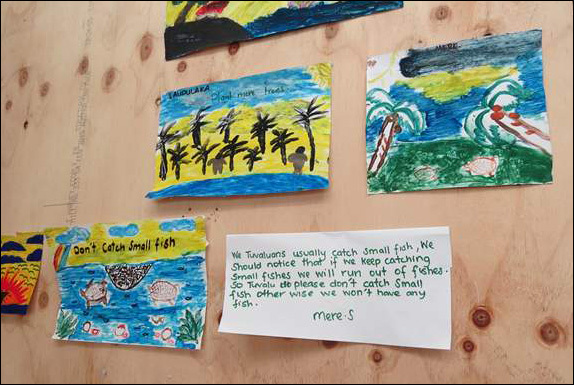 I leave you with the words of the Prime Minister: Save Tuvalu, Save the world. Think about what you might be able to do to help.